While growing up in a family enamored with meditation and self-awareness, Mallika Chopra '02 found she had little interest in the pursuits that happily occupied the rest of these relatives, which includes her father, well-known holistic healer Deepak Chopra. That, says Chopra, all changed when she found out she was pregnant with her first daughter, Tara, and began nine months of reflection on the joys — and responsibilities — of motherhood. "I grew up in an environment where people were on a self-development path," Chopra says. "When I became pregnant it was my entree into that world. It's a very exciting and spiritual time. I spent a lot of time thinking about how I wanted to raise my child and the influence I would have on this little being." Chopra's transformation is outlined in her recent book, 100 Promises to My Baby (Rodale Books), a collection of short essays, poems and family lore illustrating the values most important to her in her new role as mom. 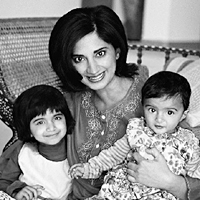 Writing the book, Chopra says, was "a natural and organic process" that evolved from journaling during her two pregnancies with Tara, now 2 1/2, and Leela, now 10 months (pictured with mom), and reflected her concern over how their lives would unfold. "I was five months pregnant (with Tara) on Sept. 11, 2001," Chopra says. "I started thinking a lot about what kind of world my baby was going to be born into." In her book, Chopra promises her daughters that she'll "foster your bonds with the generations before and after you," "show you the freedom that comes from being able to laugh at yourself" and "reach for balance in my life and yours." Four major sections celebrate the gift of parenthood by addressing topics such as life choices, values, spirit and purpose. While pregnant with Tara, Chopra decided it was time to return to school and complete the degree she knew would be important to her future success. She also knew finishing her MBA during such a hectic period wouldn't be easy. During her last quarter at Kellogg, she alternated between classes, all-hours study groups and mothering her newborn daughter. When asked if she fears her book places too much responsibility on mothers for how their children ultimately turn out, Chopra's answer is unequivocal. "No, I really believe that as parents we are the strongest influence on our childrens' development by providing them with a sense of security and love," she says. "The fact is that we are all going to make mistakes. No one is perfect as a parent and we are all learning as we go along. Parenting is a huge responsibility and you have to embrace that, but at the same time, not get stressed out by it." In addition to the guidance 100 Promises provides to new families, a portion of the book's proceeds will benefit children living with very few resources and without the love and support of parents, as Chopra plans to donate some of the money she earns to UNICEF programs aiding orphans affected by AIDS. For more information, visit babypromises.com.